I used to be a very monogamous knitter. Key phrase there is used to be. 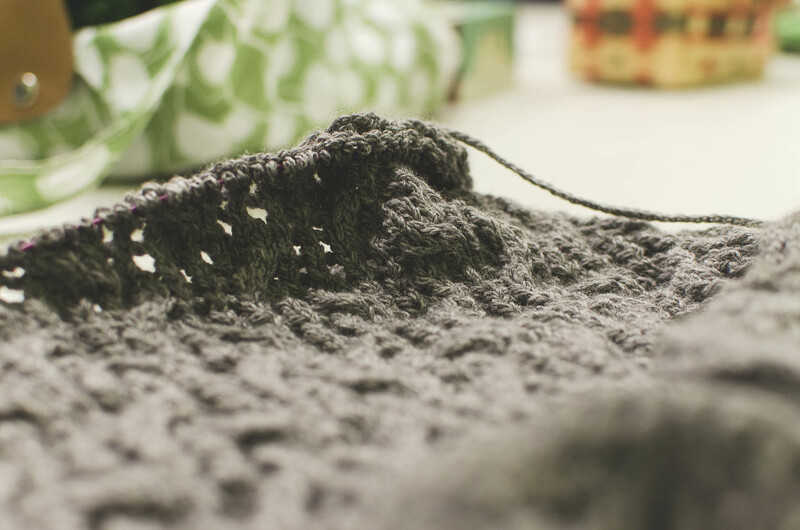 When you first start to knit, it’s a labor of love. You drop stitches. You revel in the grotesque thing appearing on your needles because, well, you’re making it. My first few projects were beyond hideous, but they were mine. And since as a new knitter you concentrate on making one simple movement after another, you don’t have time to get distracted by multiple projects. Knit, purl, knit, purl, repeat. But after a while, it tends to get boring because after you’ve mastered the knit and purl stitches, you start realizing that there is a world of new skills to be learned. So your eye starts to wander a bit. Ooooh, look at that soft merino blend. I think I’ll take you home. Lace? You mean that a hole is something you do on purpose and it can look pretty? Who knew! The first time you cast on a new project before you finished the previous one, you get this little pang of guilt in your stomach. I really ought to finish that scarf first. Come on . . . you were falling asleep last night working on it. Challenge yourself! But won’t the scarf suffer if I don’t work through this boredom? It deserves to be completed. You can always go back to the scarf if you need a break from the charts. I mean, you need a vanilla pattern to keep up with this complex one. Fine . . . I’ll try it just this once. Kinda sounds like the plot from a bad romance novel, right? Pure cashmere . . . Lucy loved it! Still working on it. And so you become a serial project philanderer. You start catting around on your knits. The scarf/shawl/sweater/socks that you caught your eye earlier in the month was now shoved in the bottom of a bag. The only way out? Buy another bag, of course, and shove that guilt so far down that you’re pretty sure it doesn’t matter any more. Occasionally you’ll decide to “own” your number (usually after a plucky new knitter says how ludicrous it is to have more than one project going and you snicker a little inside doing your best Wicked Witch of the West cackle) and vow to get a grip on your WIPs. I did that last December and wrote down all my unfinished projects. Twenty-nine. I have 29 works in progress. That figure might have changed a bit since, as a serial project philanderer, I’ve cast on a few more projects since then. Of those projects, roughly half of them make zero sense to finish. Do I really need this pair of wrist warmers? Well, I guess if I lose the other five pair that I’ve knit, sure. Clearly I was delusional casting on a pair of turquoise and orange color work mittens. That can be the only explanation . . . a break with sanity. Something I finished. It happens from time to time. The projects that make me the saddest are the sweaters. 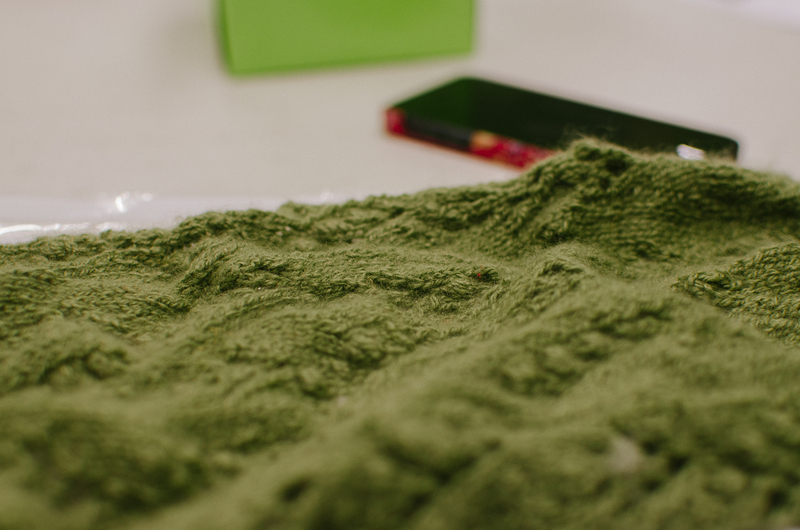 Sweaters take a lot of commitment on the part of the knitter because you need to purchase massive quantities of yarn (check), find the correct needles (check), and devote the time and care into the product (let me think about that for a second). Earlier this year, I started knitting on a beautiful maroon lace pull-over that I started four or five years ago. I loved this sweater when I started it. It’s knit from the top down with raglan sleeves and subtle waist shaping. The lace is easy to memorize and extends to the top of bra line plus it follows the sleeves down to the cuffs. Best part? It looks just like a pattern I fell in love with when I was leaning to knit. I finished the body in February and tried it on. Hmmmm. Why was it so loose? Checked my gauge . . . spot on. What the hell was wrong? Wait. Four to five years ago, I was a solid 60 pounds heavier and was knitting sweaters about two to three sizes larger. That would explain the loose fit through the waist and at the bottom of the sweater. But even after having this internal dialogue, I decided to continue knitting a sweater that I thought might – might – work out if I just persisted. Funny thing happened. Another project caught my eye (fine: three projects caught me eye, but I finished them so back off) and the sweater was shunted away yet again. After I finished a hat for the shop two days ago, I perused my list of WIPs and decided to pull the sweater out of the bag and begin working on the sleeves again. A few rounds later, I shoved my arm into the sleeve . . . and came to grips with reality. This sweater is not destined to be finished any time soon. Turns out the sleeves are looser than the body because they are all lace. There is no way that I’ll be happy with this sweater because it’s too loose. No amount of finesse or blocking or trying to take in the sides will fix the loose arms. So I’m admitting defeat on this one. And probably for all the other sweaters I started a few years back. Because with all the patterns out there, why be faithful to something that isn’t going to fit? Not when something new is likely to come sashaying my way.